I have to admit, after spending a few weeks in paradise, I felt some post vacation blues after we returned. It didn’t help either that it took a week before my food allergies was gone and I felt normal again. Being at the beach or doing some sort of water activity for almost a month, will leave you feeling a little blue after you come home from your honeymoon. Good thing I have plenty of recaps to do, it makes me happy browsing thru all the pictures. What I’ve done to help with the post vacation blues is to surround myself with things I love. One of the things I love is eating fresh summer produce, like these sweet as candy strawberries from the farmers market. I have frozen strawberries stashed in my freezer all year long for smoothies and such, but they are never the same as the fresh ones. The juices don’t squirt out when I bite into the frozen-but-defrosted strawberries. They even made into my daily lunch salad. I start out with a few handful of fresh spinach as the base. Then I massage the spinach leaves with tuna salad. To make the tuna salad, I drained canned tuna and mix it with mayonnaise, mustard and salt + pepper. I prefer to get my hands dirty and massage the tuna into the spinach (rather than tossing them) so that the salad evenly coats each spinach leaves. 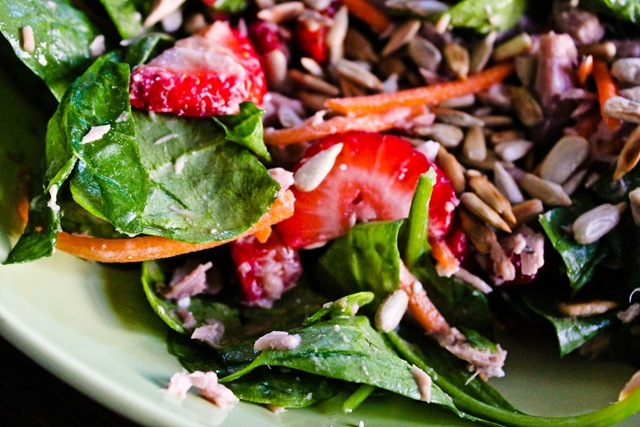 I then topped the salad with shredded carrots (great texture and crunch provider), fresh sliced strawberries, feta cheese and toasted sunflower seeds. Toasting the seeds brings out the nutty flavor even more. 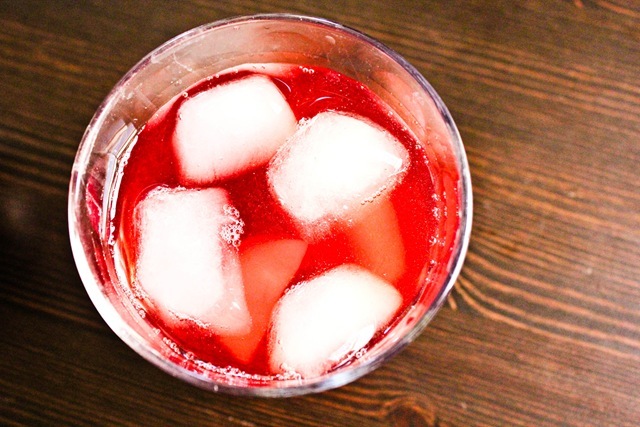 To help stay cool during lunch time, I have been making mocktails every chance I get. 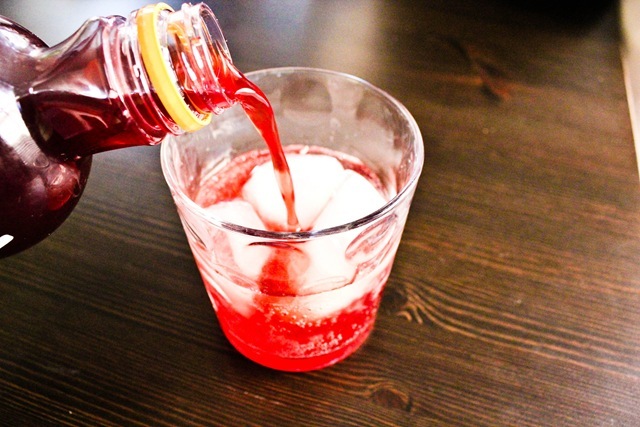 I use seltzer water and add juice to the mix. 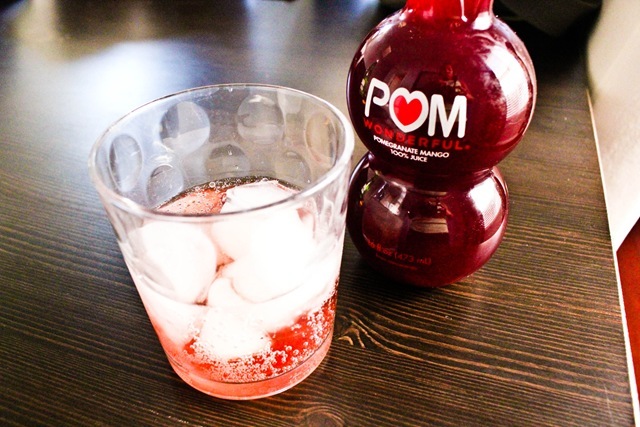 Currently, I am enjoying POM’s Pomegranate Mango juice. POM’s mango juice is tart and sweet tasting. 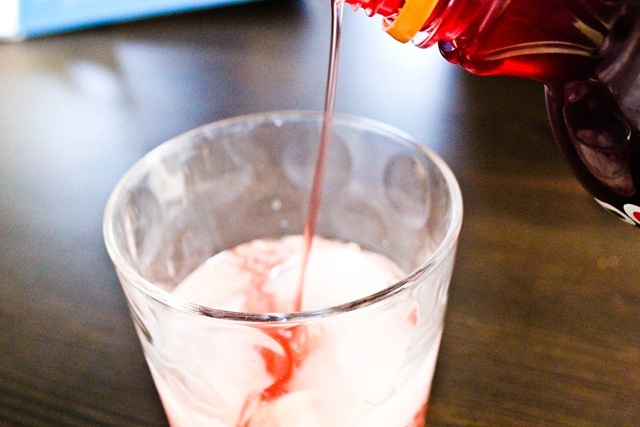 I find it too sweet if I drink it straight so I usually dilute it with some kind of bubbly water. There’s only a slight mango taste and I wished it tasted more like mango than pomegranate. But, it’s not called mango juice after all. I have been enjoying it as a refreshing drink after a hot day outside. Summer lovin’ in a glass. What have you been (summer) lovin’ so far? I’m such a visual person and anytime I’m around colors, I’m happy. I have been lovin’ all the pretty flowers, the vibrant colors I see at the farmers market, including all the fresh fruits. I love seeing the bright summer outfits whenever I am out and about. Ohhh I’m loving salads too girl! I hope you get out of those blues more and more as each day goes by and you spend it with the luv of your life~:D Have a great day! 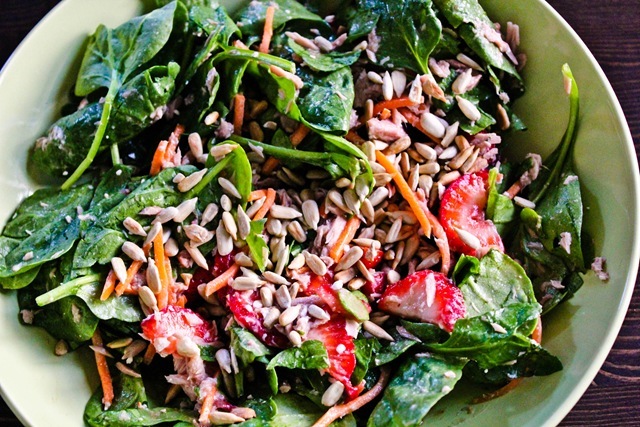 Love the salad, so bright and yummy, sunflower seeds is a great topping! 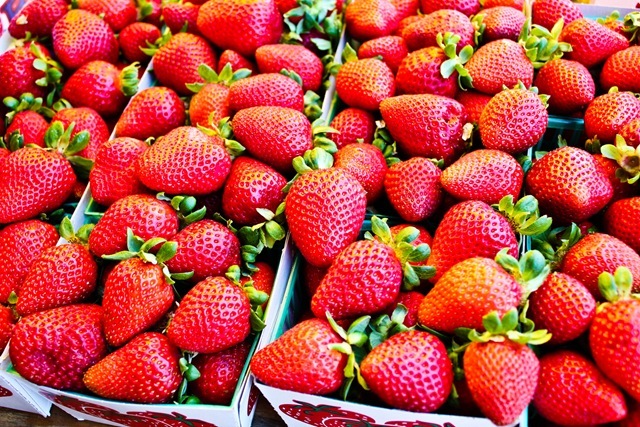 Those strawberries are beautiful, yum!! It is always SO tough to come back from vacation! Especially one as awesome as yours!! I love the idea of massaging the tuna salad into your sandwich. I might need to try that with my new chicken salad!! I just love summer overall. Its my most favorite season. The heat, the humidity…I <3. Peaceful summer morning outdoor workouts, icy beverages, fresh fruit & veggies, flip flops, sun dresses…ah! 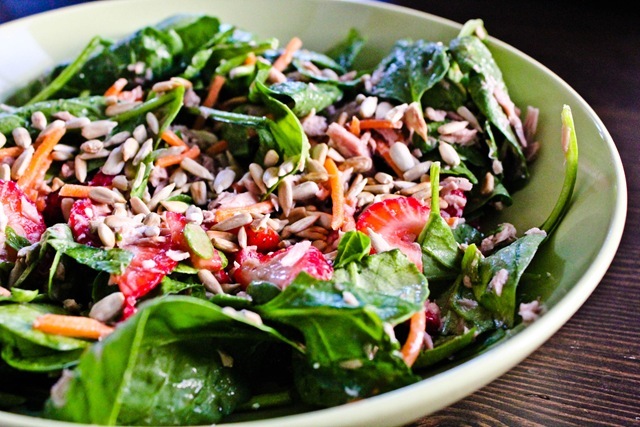 That salad looks delicious I’m having a mixed salad today with strawberries and mixed veggies. Yummm. I love the summer I’m not much of a bright color person but during the Spring/Summer I do wear more color the most. Haven’t been to Farmer’s Market in awhile so I think it’s time to start getting those colorful array of veggies and fruit that’s seasonal. I’ve been making more smoothies lately so I believe this summer that’s my approach more liquid smoothies as meals, I get this feeling it’s going to be really hot this summer. Have a colorful and festive day! 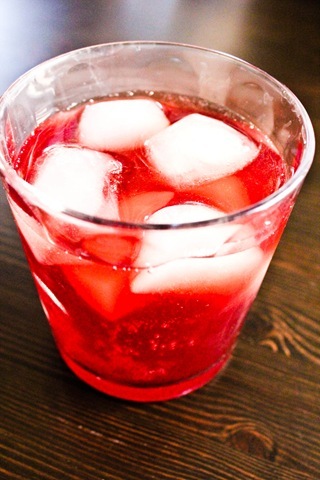 Try 2/3 pineapple juice, 1/3 soda water, and a splash of grenadine. So good! oooh pom mango? I need to try that! We have a sodastream so we always have seltzer water around. I think it’s good with acai juice! I love putting fruit in my salads! 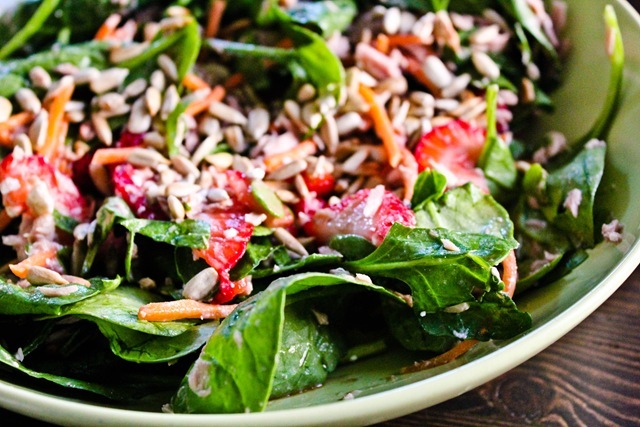 Spinach+red onion+strawberries+walnuts+goat cheese+balsamic vinaigrette is my favorite combo. I’m summerlovin’ ice cream like whoa, but I guess that’s just natural because of the temps. Not the best thing for my waistline, but it’s sooo good! I am summer loving not having to wear a ton of clothes to go out for a run. Also, for warm evenings to walk my pup. And that it smells like BBQ every weekend.